We have all learnt the story of Nalanda, the rich literature that was found in this regal realm and how it was destroyed. But let us take an even closer look into this fantastic town. Nalanda used to be the abode of one of the largest Buddhist Monastery complexes in the ancient Magadha kingdom, which is the present Bihar. Located 90 km from Patna in Bihar, Nalanda was a centre of learning from the 7th century BC and was recently declared as a UNESCO World Heritage Site. It was founded in the 6th century BC during the reign of Kumaragupta and under the Gupta Dynasty. Nalanda was an international university for nearly 800 years that attracted thousands of students from all over the world. There were students from countries such as Tibet, Persia, China, Mongolia, etc., who were all handled by almost 2700 faculties! The University was so vast that it had 10 temples, meditation centres and of course an exceptional library, known as Dharmaganja that consisted of an enormous collection of books. It consisted of books that were not only on religion but a galore of other fields such as astronomy, science, architecture, metallurgy, philosophy, law, warfare and more. The library was divided into 3 buildings, namely, Ratnasagara (Ocean of Jewels), Ratnadadhi (Sea of Jewels) and Ratnaranjaka (Jewel-adorned), and indeed these live up to their names because it had literature that took nearly 6 months to be burned down! Ironically, however, a large amount of knowledge about Nalanda is imparted to us by the writings of pilgrim monks such as Xuanzang, Hieun Tsang, and Yijing, who were from the East Asia and travelled to Nalanda in the 7th century BC. Information such as the curriculum learnt in the institution are known from these texts. Their curriculum included subjects such as logic, Vedas, study on the sects of Buddhism, medicine, etc. Nalanda wasn't attacked just by one but by three different dynasties. First, Huns from the Mihirkula dynasty destroyed parts of Nalanda under the rule of Skandagupta. However, the library was restored with bigger and better buildings and faculties under the successors of Skandagupta. Second, the destruction was led by Gaudas but again it was restored by the Buddhist king Harshavardhana. The final blow given by Bhatiyar Khilji of Mamluk Dynasty, a Turkish leader who intended to uproot Buddhism entirely, destructed the most in 1193. After this, the site was abandoned until the 19th century, when the Archaeological Survey of India discovered and excavated the site. 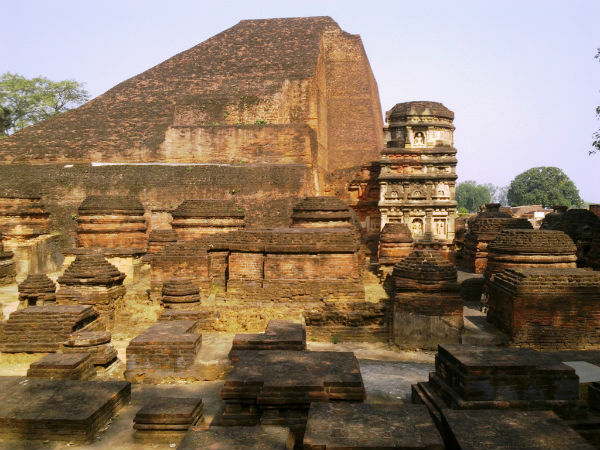 The ruins of Nalanda University can still be seen, which is spread across an area of 12,000 sq m. The buildings are built from red bricks and have fringes of the garden. It is believed that 90% of the Nalanda University still remains unexcavated! A mighty Stupa was built in the honour of Sariputra by Emperor Ashoka here, in the 3rd century BC. Being one of the remains of Nalanda, the Stupa is hemmed with flights of stairs and consists of beautiful sculptures. Hieun Tsang Memorial Hall built to honour the Chinese scholar Hieun Tsang, Nalanda Archaeological Museum, Pawapuri which is a pilgrimage for the Jain community, are some of the other places that must be visited in Nalanda. The Museum consists of coins, seals, inscriptions, and sculptures discovered in the sites of ruin. Winter months of October to February is the perfect time to visit Nalanda. The temperature in these months should be between 25 degrees to 4 degrees Celsius and will have a pleasant, balmy weather with quite chilly nights. Monsoons here experience heavy rainfalls while summers have scorching heat. By Air: Lok Nayak Jayaprakash International Airport or commonly known as the Patna Airport is the closest air base to Nalanda, which is located at a distance of 75 km. It is connected to major cities such as Ranchi, Chennai, Bangalore, Hyderabad, etc. By Rail: Cities such as Delhi, Patna, Kolkata are connected to Nalanda via the Nalanda Railway Station. Express trains are available regularly on this station. By Road: Tongas or carts drawn by horses are the local way of commuting within Nalanda. Inter-state buses are available to reach Nalanda from the neighbouring cities such as Ranchi and Patna.